What do you mean you DON’T EAT NO GLUTEN?! Ah, that’s OK. We make Gluten free lamb burgers instead! Opa! 1. Whisk the eggs and add in the flour. You can also add in gluten free breadcrumbs such as Hale and Hearty multi purpose breadcrumbs. 2. Chop the dill and parsley finely and also the onion and add to the mixture of flour and egg and mix it all in well. 3. Add the mince and roll in your hands to make a ball shape. Up to you how large but ideally keep the burgers on the small to medium size. 4. Continue until you use all the mince. 5. Pan fry or put the burgers in the oven in oven proof dish at 180°C. Cover with tin foil. 6. Keep checking and turning over until burgers are cooked and crispy. Enjoy with Greek salad, rice or whatever you fancy! 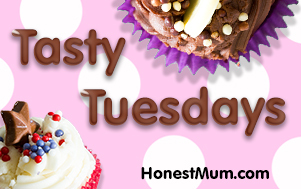 For this post, I have linked up with Honest Mum’s Tasty Tuesdays! Next Post Have Fun with a Flan! I love lamb. These sound tasty. I don’t think I’ve ever had lamb will dill before. When I make burgers I don’t use any flour or breadcrumbs at all. I only use those for meatballs.